Professional ultra fast USB JTAG for mass programming and Flash emulation. Q: What should be the polarity of the external power supply jack? A: Inner pin is + there is protection diode so you can't go wrong. Q: What is the maximum input voltage for the external power supply jack? A: There should be 12VDC regulated voltage with 100mA current source, if more voltage is applied this will overheat the internal DC/DC isolation converter, the voltage should not exceed 14VDC in any case as it will damage the unit. Q: How safe is to debug with my USB port what is the insulation voltage? A: You can connect MSP430-JTAG-ISO to high voltage target and use with USB port connection, there is 1000VDC insulation. 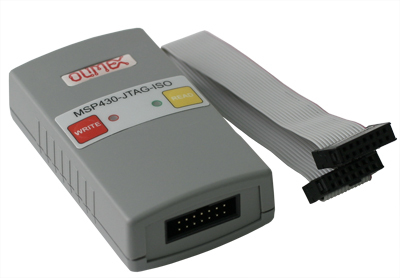 Q: Can I use MSP430-JTAG-ISO with XYZ development IDE/tools? A: MSP430.dll which is provided with MSP430-JTAG-ISO are 100% compliant to Texas Instruments MSP430.dll and will work with *every* development software which supports the original TI MSP430-FET and MSP430-USBFET hardware platforms, we have tested EW-MSP430, Rowley CrossWorks, our customers have reported sucess with MSPGCC. Q: At what voltage is target programing when MSP430-JTAG-ISO is working in stand alone mode? A: If your target is not powered externally MSP430-JTAG-ISO will power it up with 3.3V, if target is powered MSP430-JTAG-ISO will detect and follow the target voltage. Note that your target voltage should meet Flash programing minium voltage otherwise you will get error during programming.